Toast the naan bread until slightly crisp. Preheat the broiler on high. Combine diced green onion with some pizza sauce and spread on the bread. 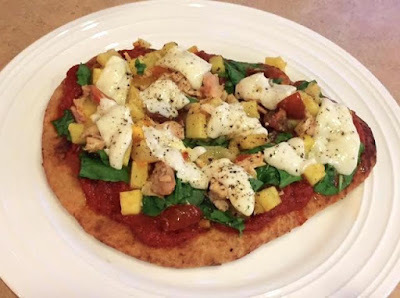 Top with spinach, chicken, pineapple, and fresh mozzarella. Set pizza on a pizza pan and put under broiler until mozzarella begins to melt. Remove, sprinkle with a little bit of pepper and enjoy! If you'd like a printer-friendly version of this recipe, Click Here!